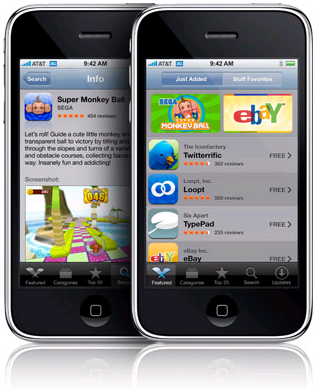 Apple’s App Store for the iPhone and iPod Touch had already been launched for about one month now. In that time over 60 million applications have been downloaded, Apple chief executive Steve Jobs told The Wall Street Journal in an interview. Any way you look at it, that number is simply impressive. While most of these were free downloads, the App Store has already churned out a solid $30 million in sales. After Apple’s cut, around $21 million of this will go into the pockets of iPhone developers (Atleast $2 million of which will go to Sega for its 300,000+ Super Monkey Ball sales). And asssuming if the sales stay at current pace, Apple will end up with at least $360 million by the end of the year and soon it will hit the magical $1 billion mark. I dont think anybody had seen this kind of pace of growth for software, its truly an impressive development for Apple and the industry. Steve believes that going forward, the phone of the future will be differentiated by software and services, a similar strategy adopted by Nokia and Microsoft and Apple certainly has a great head start over its competitors. While the rest are still trying to figure out how to put the pieces together, Apple has surely found the right recipe to entice the developers to develop around the ecosystem created by them and obviously left suffient money on the table to encourage them to keep coming back for more. This is an amazing money printing ecosystem that Apple has created where it allows any developers be it large or small to have access to Apple's global distribution channel on the internet. So now all you need to do is to come up with a good software and have it uploaded to Apple Store and make your money while sipping a hot Latte at Starbucks. Wouldn't that be ideal!! I wonder what the mobile operators are going to do about this as I m sure Apple Store will eat into their pie. I m quite certain the Operators would want a piece of the action instead of just pushing hardwares and selling data plans. Unless if they are happy to outsource that portion of the business to Apple. Probably not.... Any thoughts? And just in case if you are unaware, Apple had already sold 3 million units of iPhone 3G in one month after it was launched according to analyst Michael Cote of the Cote Collaborative.